Things are going well since I have made the van a habitable place to sleep. There have been floods and gales almost on a daily basis, but I’ve slept through them in a warm sleeping bag. Back when I lived in a yurt I was interested in being very close to the elements, even if that meant being cold and damp. Experiencing physical hardship is a challenge I’ve always been drawn to facing. But actually, at the moment I feel like I have learned all I need to from that. Right now, my question is “How can I live a luxurious life, want for nothing and yet still feel free?” It’s a challenge in a culture and economy that wants to charge people an average of 43% of their income just for somewhere to be, that insists on vehicles ownership for the usual lifestyle and where most jobs require computer ownership. 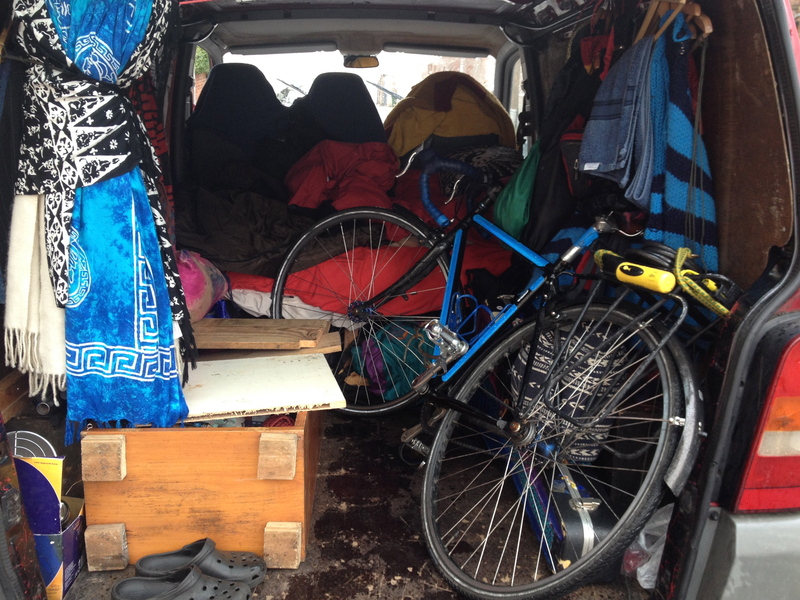 Now that I have a van, it’s mainly acting as a bed and a place to keep stuff. I’ve not spent much day-time inside it. It’s turned out to be too easy to get indoor spaces in the city. 1 month in, I’ve not yet encountered a day where I’ve had nowhere inside to go to. Sometimes I’m at work of course, but I’ve also visited friends socially, or used their living rooms in the daytime whilst they are at work. For laptop power and wifi there are cafés for the price of tea, or the library or arts center for free. Most days I still get to practice guitar and singing more than I used to. To my surprise I’ve had more time and opportunities to use my portable recording studio than ever I did when I was renting. I’m doing more music than I did when I lived in a house. So it’s going well and I haven’t felt any less creature-comfortable that I did in a house. At the same time I don’t want to scrounge off people. “Give more, take more” seems to be the space I’m moving into. I’ve always been willing to give and this lifestyle is allowing me to meet more people, which gives me more opportunities to offer help. Visiting friends is good. Having them over to visit me is proving cramped but possible. I worry a little about what I have to give to the people whose living rooms I’m using. Can’t think what I can offer apart from clearing up a bit it’s needed. So, I panic if someone’s house is too clean, but I at least try not to cost them very much. Have even worked out what I cost someone, just to give me peace of mind – fortunately it turns out to be 10-20p in electricity to have me for the day, as long as I don’t switch the heating on just because I’m there. This morning I was meditating sat on the bed, then brushed my teeth and went inside to someone’s living room to have tea and breakfast whilst setting the portable recording studio and listening to music through my busking amp. I thought, “How is this different to a normal day when I lived in a house, except that there’s more variety and change of scenery?” But most valuable of all is the knowledge that I don’t have to be in any specific environment in order to feel at home. This might be a temporary way of living, but it’s good to know that I could be happy living this way. The final part of my dialogue with Richard The Piano Tuner concerning my quest for an alternative dwelling to suit my musiciany needs. My new home is revealed at last. I’m certainly settling on the idea of a van – the conclusion you also seemed to see as the most obvious for me. You’re right that a self built interior or at least a converted vehicle with a wood burner would be the ideal – in fact I used to have one. My friend and I built the whole interior from recycled wood and had a recycled gas bottle woodburner fitted. However, the right vehicle (either prebuilt, or a shell for me to convert) hasn’t come up. 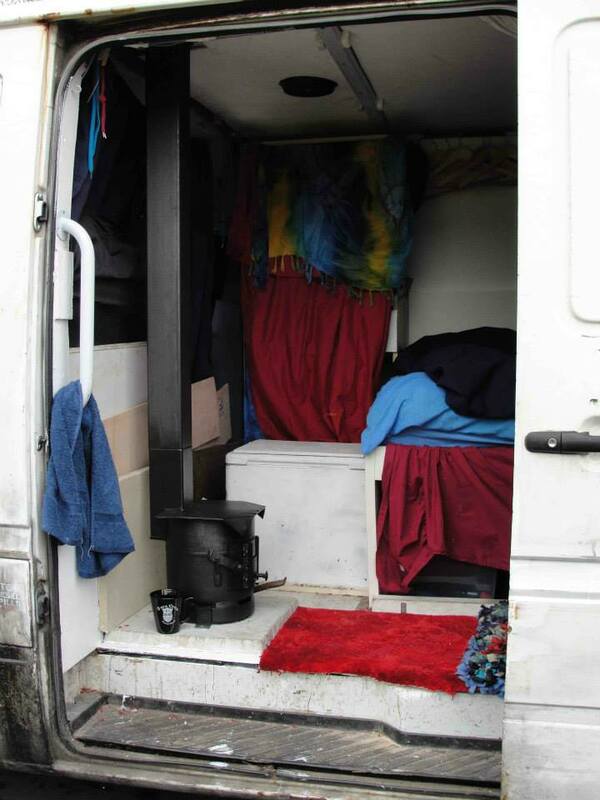 Experience has shown me that a woodburner or stove is the only effective way to heat a van in the winter. By “effective” I mean so-that-it’s-actually-warm-in-there. If I was to buy a Tardis-like pre-fab, with all the space in the world to practice guitar and even set up a recording studio inside it, but couldn’t heat it, then the van would still be unusable as a place to “be”. Coldness would send me looking for indoor spaces every day, whilst pointlessly driving around in a massive tank at 17mpg. So I may as well admit defeat and get a smaller vehicle that’s suitable to sleep in, then look for indoor spaces in the daytime hours. My new living space. For security reasons I’ll not show photos of the outside of the van or reveal what kind it is, but this is what home currently looks like to me. Having considered all these options, a good solution has come up just by chance. An acquaintance in Totnes is willing to rent me a medium sized van for little more than the monthly cost of including tax and insurance. It’s perfect because it’s the right size for me to sleep and sit in. Also, if I choose to I can give notice and give it up much more easily than I could give up a van if I bought one. 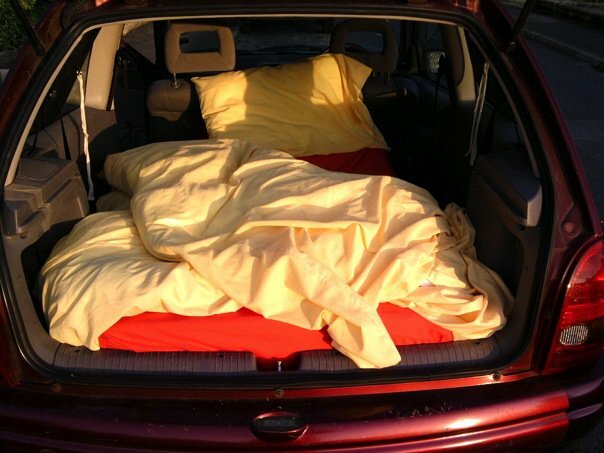 Good news – the van already has a bed. It needs a little fixing, but I can do that. But what about staying warm at night? When I slept in my yurt and it was 0 degrees C, I could be warm enough by lying in the bed, on a sheepskin, in my 3 season sleeping bag, with a wool blanket and duvet on top. Whoever said that putting anything on top of a sleeping bag renders it useless due to compression, was exaggerating – A duvet over a sleeping bag is definitely warmed than two duvets! 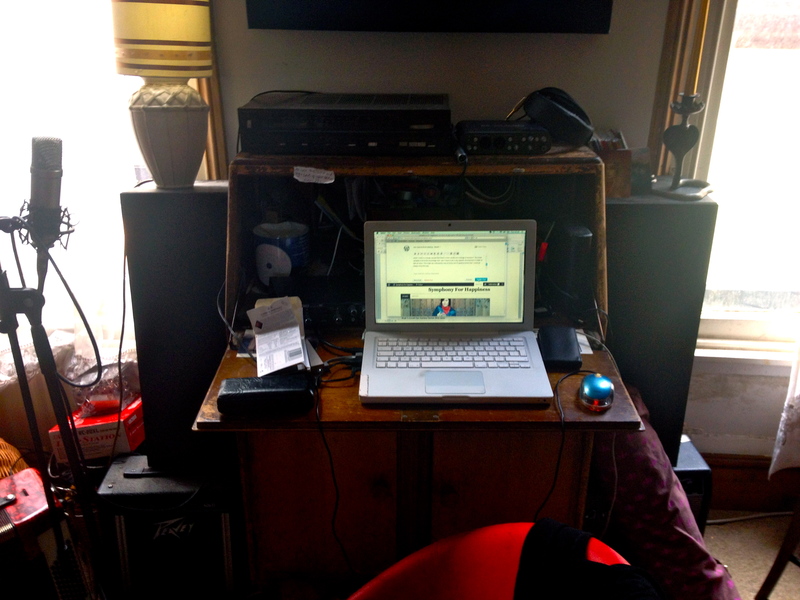 The studio is ok and I’m hoping it’ll survive the temperatures in the van. One of my waterproof pannier bags will keep condensation away from it. I’ll simply have to take a risk with the busking and keep it in the van, because I use it so much. Other perishables include a bag of audio cables, live mics and a bunch of instruments. My main acoustic will be ok, because I’ll take it with me everywhere. It’s in a hard case, which protects it against damp and temperature changes. The other instruments are less protected, in soft cases. It would cost hundreds to buy them all hard cases. On my album I plan to record vocals, acoustic guitar, classical guitar, bass and ukulele. I’d like to record piano too, but I won’t get one of those in a van! Obviously space is a little tight. But the bike just about fits in. 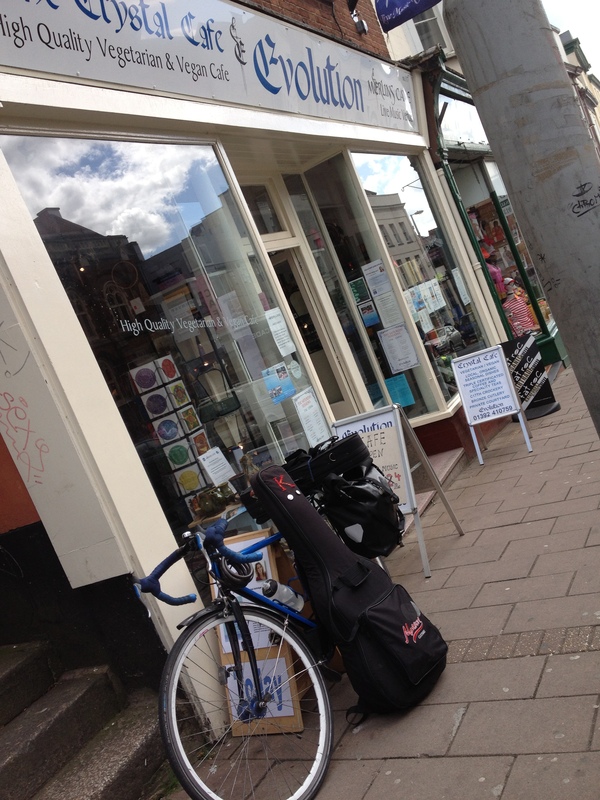 It would be ideal to have all those instruments with me so I can use them any time… but will they perish in a van? Probably yes. The Ukulele is already damaged from being in the yurt. The pickup stopped working and the bridge is coming unglued. I know someone who left their busking amp in a car for 2 winter weeks and it stopped working until they had dried out indoors for a week. The alternative is to find somewhere to store the music gear and still have regular access to it… I’m working on that one. Do you mind if I put some our dialogue into my weblog? Of course I’ll let you read and approve the post first: Richard’s advice to someone wanting to go houseless. The input that someone in your position can give to someone in my position might be a useful to others who are trying to make a transition. I certainly find myself reading your older posts from when you were carrying more stuff. They are helpful to my process paring down into a van, because I can’t imagine myself without a sleeping bag or towel. That’s great news! Takes care of accommodation and transport! I’m glad you’re out if the fix, I assume the van will get cold after a few hours with the engine off but nothing lots of bedding won’t remedy. Plenty of time to think about the van’s limitations and how you would make it so much better. After 40 odd days “houseless”, I decided to find a new home. I wrote to “Richard The Piano Tuner”, explaining my situation and asking if he could think of any good options for me. To my surprise he wrote an incredibly detailed response, which I am posting in full, in case any other’s who are thinking of going houseless find it interesting or helpful. And yes, yes, I know I promised to reveal the nature of my new home in this post, but I’m afraid that will have to wait till the next one. I’m afraid I don’t have many ideas for your immediate accommodation crises. All I can think of is to plonk all your stuff somewhere accessible, if you don’t want to bother other people a small 24 hour access storage unit in Exeter might be your best bet. I’ve even slept in such a unit a few times. Then invest in a proper arctic grade sleeping bag and mat and be warm as toast at any temperature. That would be all your savings, but perhaps a better investment that some temporary accommodation? It really does have to be experienced to be believed, waking up on a frosty morning and feeling toasty warm and cosy. Your body does produce heat when you sleep, the secret is learning how to conserve it. I would say that a good sleeping bag is worth a whole year’s rent if you sleep in it every night. But I’m missing the important point here, which is that it’s not about sleeping outside every night. A lot of nights you might end up crashing where you did the gig, or at a friend’s place. But you won’t know this until you actually try it. And hostels don’t have to be for living in (which might cost £300-500 per month). For me they are just a welcome break from the outdoors, I spend £20, stay two nights and go back out all dry, clean and warm with everything fully charged. It’s so much more than just a bed, some even include a bottomless breakfast. Having said that, I’m a large male living mostly in London where great hostels abound. I don’t want to guarantee it’ll be as easy or secure for you in Exeter. Thinking more long term, your problem is having a lot of stuff and wanting to move it great distances at high speed on a regular basis. This requires a lot of energy and the easiest way to get this energy is from fossil fuels. In particular you have a problem with gigs further afield but always having to get back to one place quickly for regular commitments. I don’t have an easy solution for you to continue doing this cheaply or in an environmentally friendly way. Living in a van it might seem like a downwards spiral: less work/gig commitments = less money for fuel and van maintenance = less ability to make commitments, might as well do nothing. Or the upwards spiral: more commitments = need more money for fuel and van = need more commitments, busier and busier for what? Be ruthless with your stuff. Yes you need a good guitar and some studio kit, but think very carefully about what else you really need. Not long before I ‘moved out’ I built a very powerful desktop PC from £2000 of carefully chosen components. I justified my dream machine in that it would make my web coding, research, and music production work so much faster and more efficient. But my lifestyle choice took priority and as difficult as it was, I gave the computer away to my dad’s business before I even got it fully operational, such was my excitement at the prospect of a free and simple life. I also had to give away 95% of my tool collection, this is a big deal for a bloke like me who only invests in the best tool for each job. What I discovered was that tools and computers were not the limiting factor, my brain was the limiting factor to my progress and creativity. Now I’m mobile my brain is on overdrive and when I actually sit down to work on any computer or piano the ideas pour out nonstop. What’s more I was born at the right time, we’re so lucky that technology is moving forward at breakneck speed. I thought that when I want to start recording and sequencing music again I would need a laptop which would be easy enough to carry around but oh no, my latest smartphone has a 2.3 GHz quad core processor, 3Gb of RAM and it will host external USB audio devices like sound cards and stereo condenser mics. The software options for audio sequencing and editing on smartphone platforms are expanding by the minute. So it seems all I will need is a high quality microphone. Anyway I give this just as an example, your music and your needs are probably different. Be ruthless with your commitments too: put your foot down and say no to opportunities when they don’t meet your criteria. For example, turn down gigs that are too far away or that don’t cover your travel costs. Put your principles first: consideration for your own sanity and for the environment. And finally as the months pass look into yourself and think about whether you want be to a local person or a nomadic person. This is only about now and the near future, you can switch between the two at any point in life. What I mean by local is your weekly commitments in Exeter – if you didn’t have them you could sleep in the pub or in your van next to the pub where you did your gig, or with the friend you came to visit. There’s no hurry and no rushing ‘back’ somewhere, just chugging merrily along to the next thing. If you value a sense of familiarity and local community more, that can also be wonderful but being realistic you must consider dropping the travelling and compensating with more local commitments. I think the big problem in modern developed society is that we want to have all the benefits and security of a permanent home in one familiar location, but we also want the excitement and freedom to travel the whole world. I don’t need to say anything about why that’s not sustainable, not environmentally, not economically (unless you’re filthy rich), and maybe not so good emotionally and physically if it makes life stressful. So in summary the balance would be less stuff, enabling smaller van with cheaper running costs, and less travel distances either by reducing commitment to one place or turning down opportunities that are too far away or both. I think if you work patiently and diligently at this from every angle you will find a space for yourself. This is something I’m discovering myself this and last year, that I make the rules about what I agree to do and where I go, and if something doesn’t agree with my principles I say no. The front page of my website piano-tuning.co.uk now reflects this, because I want to be less busy and travel at a more leisurely pace I’m only taking on my favorite type of work that’s more relaxed and pays well. For various reasons I have very little money left here in Israel which has been most enlightening, I’m living off less than £2 per day and finding an amazing amount of delicious food thrown out by street sellers and supermarkets. I’ve come to the incredible realisation that I can do whatever I want with my time, all day, every day, which has been invaluable for my current research into the origin and meaning of life. Attached: a photo of one day’s spoils, food destined for landfill that I ate. It’s available every day except for the Sabbath. I’m sure you’re aware that some folk buy a cheap secondhand builder’s van and convert it to a living space. It needn’t be that cold if you take the time to heavily insulate it and consider installing a little burner. Of course much better to buy a vehicle purpose-built for living in, and less legal issues. Something to think about: what exactly is it that makes bricks and mortar warmer or dryer than a van or a boat? What would you need to do to a van to be comfortable storing electronics there? I’ve been in a lot of buildings that are more damp and draughty than some of the cosy boats and vans I’ve been invited into. I think a van is more practical for your lifestyle and gigging, but in your own time do check out the boat links I sent you because it really is a beautiful world. It’s immersion in mother nature. As a long term idea, boating you would have to build an extremely relaxed schedule around the waterways and the coast and all the blockages and stoppages that can entail, or just rent a mooring and get involved more locally. Travelling by boat, you cannot be in a hurry, ever, it just doesn’t get you anywhere. Note that most major cities and towns are accessible by boat for historical reasons. Back to the short term, if you do need to work and rent to see the Winter out its not the end of the world, as a temporary measure. Just think twice before you sign any one year contracts! Sorry if that’s all old news to you, I hope some of it helps. Sitting in my new dwelling today I wondered how to write a post that would best explain how I came to be living here. Well, whilst I was making my decision I was corresponding with Richard The Piano Tuner (piano-tuning.co.uk) so it seemed easiest simply to post that dialogue here. I am thinking very carefully about my lifestyle, having lived without a house, van, or yurt for the last month and a bit. Of the 42 days between then and this coming Sunday, I will have spent 4 nights at my Dad’s in Oxford, had house-sits for 12 nights, and have been sofa surfing for 26. I’ve been amazingly lucky with house-sits and if they happened all the time I probably would just do that permanently, but alas all good things end and it’s time for me to find me feet, or fly the nest, or some other metaphor. Honestly, it’s been more than 40 days and nights, so if Jesus had worked out what to do by that time, surely I can too? I suppose the UK hasn’t exactly been a desert (!!!) but nevertheless, soon I have figure out what to do next. I’m not a “house” person and I would like to live some kind of alternative lifestyle that has a lower impact on the environment. So, the puzzle is this: the life I want to lead, pitted against the resources I have. One resource is money. I know that I can’t currently afford to rent or buy a property whilst working part time so that I can devote half my week to being creative as a musician. Like you, I’m keen to dip in and out of various different solutions and feel free to roam. I don’t like being tied to renting because that has a knock on effect: Must pay rent, must have steady job, must stay in one location. To be in Exeter 4 half-days per week for work. To have a place to practice guitar and vocals (if not more instruments) and use my computer and portable recording studio every day ideally (unused living rooms are good). To have a safe, secure space to keep my electrical stuff, and still be able to access it. Permanent Cycle Touring like Richard The Piano Tuner: An immediate no I’m afraid. 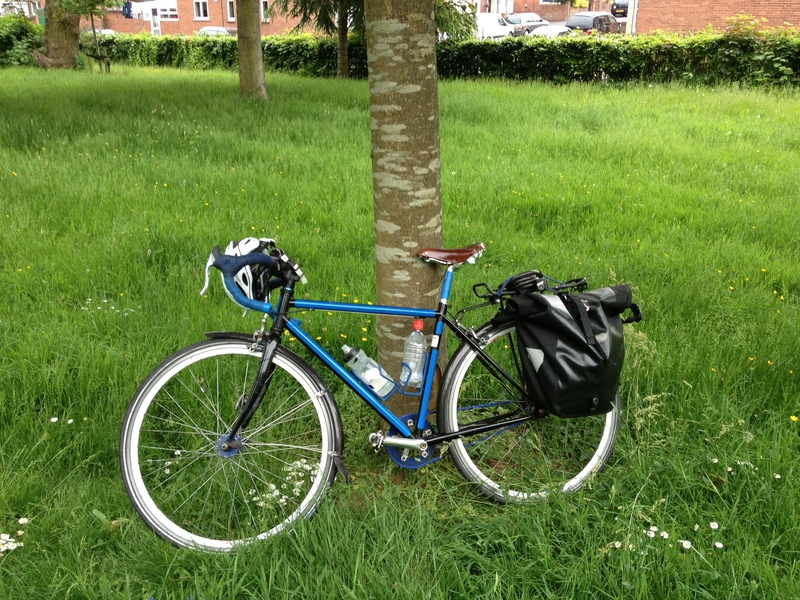 My 2012 of only using a bike as transport showed me that it’s simply not compatible with gigs. Van living: I don’t really approve of vehicles but see above. I think having a vehicle instead of a house is kind of ok, since most musicians have both. However, now that diesel is so expensive a big van to live in would cost more to drive than taking the train, so it’s not hugely practical. On the other hand, if the van was big enough I could practice and record in it. But another problem with vehicles in general is that electrical music gear can be damaged by being kept in one all winter. Small Van or Car Living: I used to sleep in a little car, and spend half the month in it. It fitted my gig stuff, clothes for a week and a bed in it, and the rest of the time I spent outside, at work, or with friends. Then I’d come back to my parent’s place in Oxford and recover for a bit. However, right now it’s winter, so a car or small van would be rubbish to live in. I hate living somewhere that I can’t stand up. Also, this time around I don’t have a place to keep my things besides that vehicle. Therefore I’d be limiting myself to only owning what would fit in a car. I know you live on a bike, so for you that would be an upgrade, but for me… tricky. I’d be interested to hear your ideas. My next post will show Richard’s response and reveal where I chosen to live. Firstly, to explain why this blog has moved. I am a musician. I lead what could be called an alternative lifestyle. I used to have a separate lifestyle blog ( fulltimefixie.wordpress.com ), but now I realise that my lifestyle and the music I make are inextricably linked. Therefore, I’m starting to write here about everything from the music, to the process of making it, to the lifestyle that draws me towards. I’m grateful to those who have contributed to the blog-onisphere with their alternative lifestyle stories, because reading about their experiences constantly helps me to carve out my own. In response, this blog is my contribution to that pool. In the UK and most of the west, the convention is to live in a house. This means mortgage or rent, which spells out get-a-full-time-job-and-stay-put. This doesn’t work for everyone and in the current economical climate, many people who are working full time are struggling to make ends meet, especially if they have a family to support. So what’s the alternative? For the single, couple (but maybe not so much for families) there are advantages are there to living in a tent, squat, caravan, boat, van, yurt, shed, community or even sleeping rough. They can range from having a rent free lifestyle, to travelling freely, to spending more time outdoors. I want to make my art either full time or for at least half the week. But working part time or being an artist full time, doesn’t create enough income for me. Option 2 – Cut living costs somehow without having to eat only catfood. 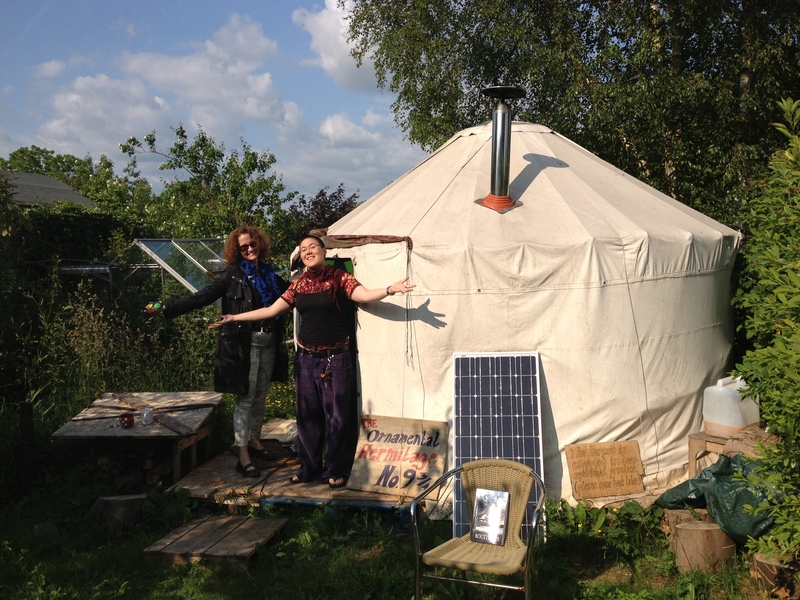 My friend Melissa and I outside the Yurt had pitched in a willing garden up until last month when it was sold. For many artists going rent-free is the obvious answer to the puzzle. Rent is apparently rising much faster than people’s salaries and the average tenant spends 43% of their income on rent, although the figures seem to vary depending on where you look. Growing all your own food might be another way of slashing living costs, but as tricky as becoming houseless is, I think it’s an easier option than self sufficiency. In a Vansion (my joke name for a Merc Sprinter) – part to full time for 1 year. In a Yurt pitched in a garden – Full time for 6 months, part time for 1 year. It might sound a bit rough to some of you, but living somewhere other than a house isn’t necessarily a downgrade. It depends on how you think about it. 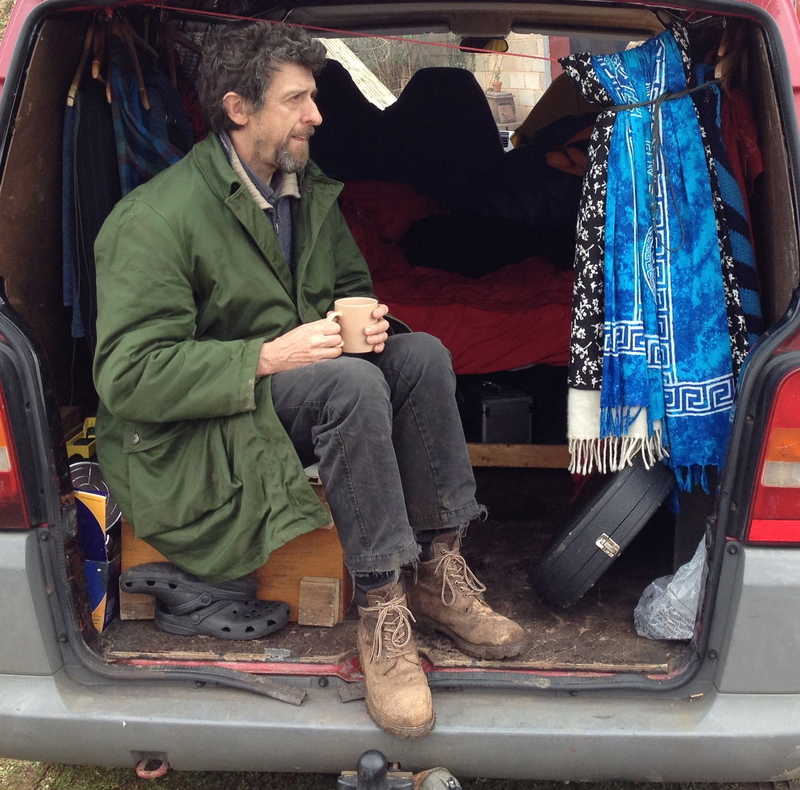 When involved in Occupy Exeter, I met quite a few homeless and several houseless people. The distinction between homeless and houseless lies within the individual’s opinion of their situation. Big Issue guy Graham Walker mentions this idea in his writing, saying that anyone can feel homeless regardless of where they live – it’s about not feeling at home. Houseless was a term I came up with for those who have chosen not to live in a house, but who do not feel homeless. Houseless people are not those who have tried to live a conventional indoor life and failed, they have simply decided to do something different. One amazing woman in Devon (anon) who found a secret location to build a wooden dwelling for herself out of scrap wood, with no vehicle and no budget. Jake and Jane my folk-bandmates. Jake spent 3 months building a scrapwood shed in the woods and lived there with his partner for a further year and a half, whilst earning all his money from busking. Jane lives out of a backpack, only travels by hitchhiking. She travels around teaching bushcraft and busking and sleeps rough a lot of the time. Sometimes we find it hard to get a rehearsal organised – no-one ever has phone reception.